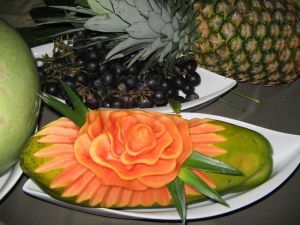 Fruit carving is a delightful way to make food into art, or to make fun art that tastes good. It’s all about letting go of your inhibitions and using fruit as your medium for artistic expression. Children and adults can enjoy two hours of discovery while our teacher guides the student(s) through the process of crafting foods like melons and carrots into flowers and insects. This class gives new meaning to the phrase “making dessert”. Do you remember the silly fun you had when a young person compelled you to help them building their sand castle at the edge of the ocean surf? 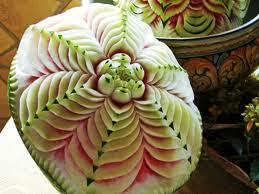 Fruit carving can evoke the same innocent fun and sense of discovery. Taking a simple piece of ‘food’ and crafting an animal form, or creating a spreading flower creation, can be a delightful way to spend an afternoon in Ubud. Our guests are always surprised at the many techniques our guru employs to craft a special shape from a simple fruit or vegetable. And this is a craft one can employ in the future to make your important holiday meals just a little bit more unique. Persons of all ages can enjoy the fruit carving class offered at W.S. Art Studio. Set aside a few hours with a special someone to laugh and marvel as you craft a carrot ‘butterfly’ and a ‘lotus’ melon at our gallery. Leave your normal day behind and settle in to explore this nuanced craft with our Balinese expert.